Have you gotten your Premium Starter Kit and just not sure exactly how to incorporate everything into your daily wellness routine? You are invited to a 14 Day Challenge to help you "Get To Know Your Premium Starter Kit"! Beginning March 26, 2018 I'll post helpful information once a day that will get you familiar with the oils, Ningxia Red and Thieves Household Cleaner in your Premium Starter Kit! I'll also share some great information on the Essential Rewards Program and why you need to be on it! Not a Young Living Member yet? This challenge may help you see why you should be! Stick around so you can learn more. 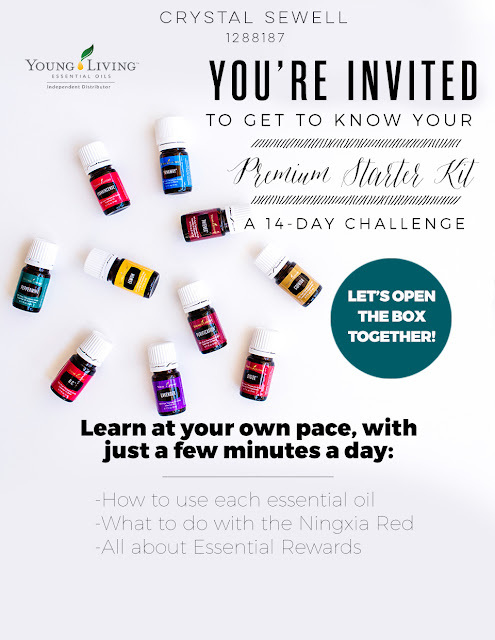 If you'd like more information on what is included in the Premium Starter Kit and how you can get your very own, click on the pretty button below!